Bringing iconic cosmetics brand Kevyn Aucoin into the ecommerce era with a new website and marketing promotions. Our first task was creating the visual design for the new ecommerce-based Kevyn Aucoin website. Email campaigns for their marketing promotions dovetailed with the new design. Continuing site improvements gave them greater functionality and new promotional landing pages. 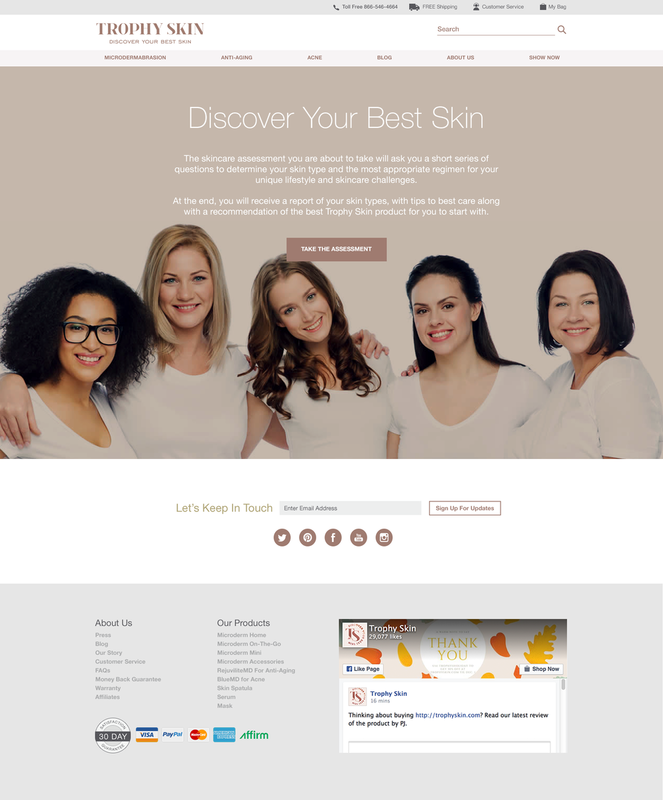 We worked with the Trophy Skin team to improve their brand and digital presence with a redesigned website and updated marketing materials. Rather than do a complete one-time overhaul, we strategically planned the website redesign to gradually evolve their site over six months while simultaneously focusing on improving their conversion rate. It looked dated and was creating a high bounce rate. They wanted to level up their brand but found their old website and branding was holding them back. We worked together to research and conceptualize how their new website would position them as an authority in the skincare device market. We evolved their site with an emphasis on social proof, beautiful design and positioning the brand as a player in the prestige beauty market. During this time the website was further optimized with CRO testing. 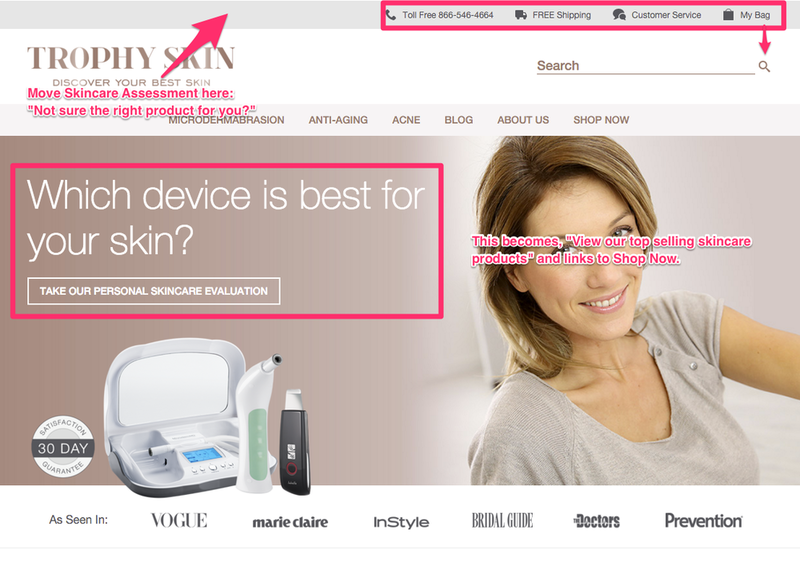 We continue to build additional functionality to the site as seen here with the skincare recommendation guide and comparison chart. We have also helped them improve the design on additional brand touchpoints such as the websites for Neiman-Marcus, Nordstroms and Amazon. Creating customized product pages on 3rd party retailer sites like Amazon and Costco to extend your brand's message and engage customers. While branded websites are important destinations for many beauty shoppers, a significant percentage of sales take place in marketplaces or websites of third party retailers. According to a new report by 1010data, Amazon Marketplace accounts for 21.1% of online beauty sales in 2016, the largest of any other online retailer. Just looking at these numbers shows you shouldn't neglect your presence on 3rd party retailer sites. While these sites can feel very templated and uninspiring, many of them allow for customization which will allow your brand to stand out. When your brand is in a sea of competitors, even small customizations can make a difference. 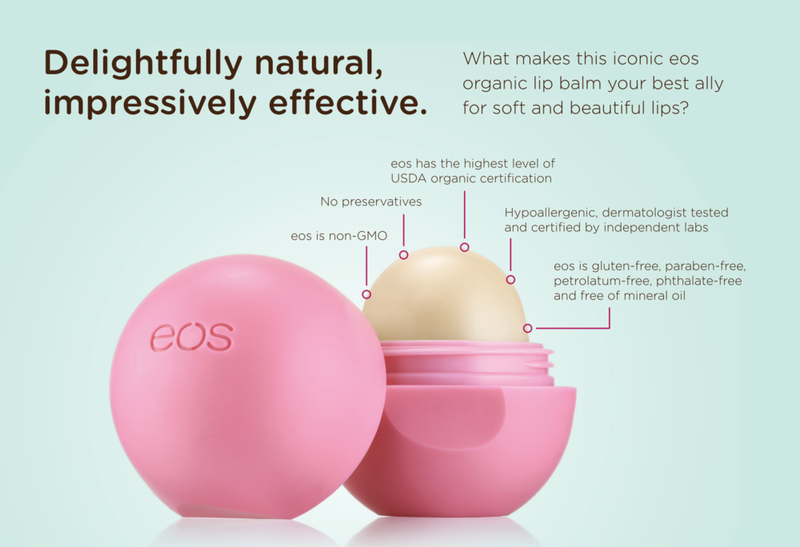 For instance, EOS had listings on Costco and had filled in detailed information about their products. However, due to lack design, it didn't feel visually connected to their brand. We worked with them to create product landing pages that would work on the Costco website but also look like a cohesive part of their brand. We redesigned EOS's Costco product pages to reflect their colorful and fun branding and stand-out from other listings on the site. Similarly, Amazon allows for customization too. “With a personalized Amazon Page, you extend your reach to Amazon.com customers and encourage immediate sales through a familiar and trusted purchasing environment. Link to content on Amazon.com, feature products, and lifestyle imagery about your brand,” the company explains. We redesigned Trophy Skin's Amazon product pages to educate customers about their product and results which helps distinguish them and build brand awareness. While the possibilities on 3rd party retailer websites might seem limited compared to your own branded website, these examples show the value of exploring their customization options. Encouraging interaction and engagement between the brand and their fans. With the rise of social media, user generated content is becoming increasingly critical to the success of brands. Customers want to be more deeply involved with the brands they love. GoSmile needed a new website that would help differentiate their growing line of products, reflect the beautiful design of their products and improve user experience. GoSmile is the premier, luxury tooth whitening brand. From their beautiful packaging and the elegant product designs, it’s immediately clear that they’re a step above the average teeth whitening you encounter in supermarket. However their website had lagged behind on proprietary software that restricted the functionality of the website and made updates extremely challenging. 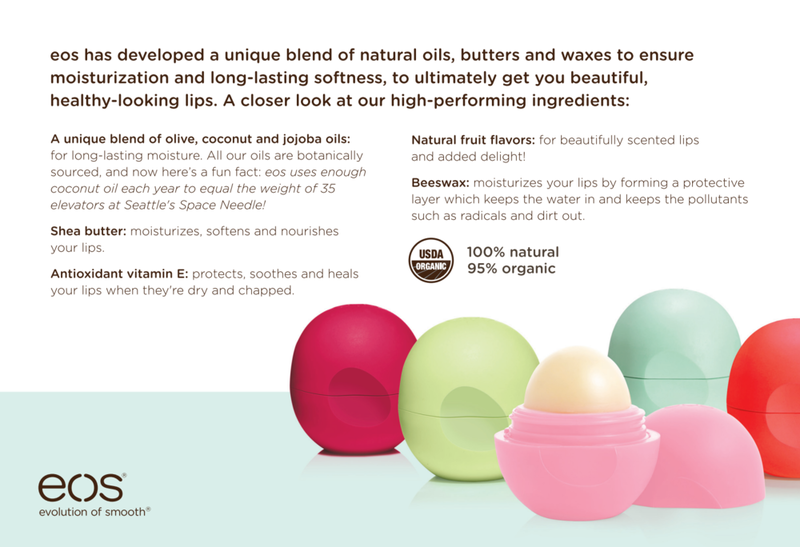 I love their products and was delighted when they approached me about their website. They wanted to move to Magento, get a responsive design, and, in the process, re-conceptualize their website.